Sandy designed the Rainbow Buzzer as the perfect point buzzer to be used stand-alone or in a team with say a size 10 and 12 or 12 and 16 Blank Buster Buzer on the dropper. The petrol coloured Rainbow bead with its colour tag often attracts trout who hit it well. 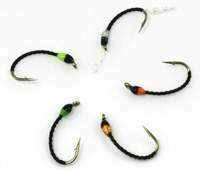 Sandy's Rainbow buzzers use incredible petrol coloured or Rainbow beadheads and have fluorescent tails colour matched to the Sandy's Blank Buster Buzzers. These are our best beadhead buzzer collection 2 each of Sandy's Rainbow Buzzers in size 10 colour matched to the Blank Buster Buzzers.